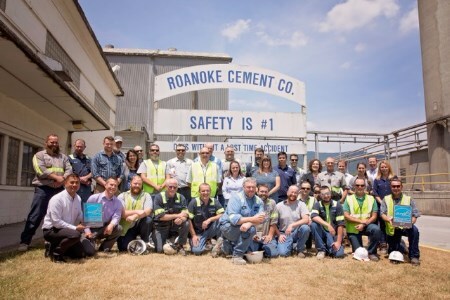 Roanoke Cement Co. (RCC) has achieved ENERGY STAR accreditation from the US Environmental Protection Agency (EPA) for the 11th consecutive year. Roanoke is the only active cement plant in the state of Virginia. To qualify for ENERGY STAR rating, RCC was required to perform in the top 25% of cement plants nationwide for total energy efficiency, as well as meeting strict environmental performance levels set by the EPA. Since 1992, RCC has invested over US$100 million in capital upgrades at the plent, propelling itself to the “highest echelon of 21st Century industry,” said Representative Bob Goodlatte of Virginia’s sixth congressional district. As well as ENERGY STAR accreditation, “RCC’s limestone lake restoration, Appalachian Trail access, and Catawba Creek improvements have created a legacy its community recognises and appreciates,” Representative Goodlatte continued. RCC is a subsidiary of Titan America, a heavy building materials producer in the eastern US. Headquartered in Norfolk, Virginia, Titan America supplies cement, aggregates, ready-mixed concrete, and fly ash beneficiation. It is part of the Titan Cement Co., a global building materials company headquartered in Athens, Greece.